Swing Overview: The classes used to create GUI components of the following list are part of the Swing GUI components from package javax.swing. These are the latest GUI components of the Java2 platform. Swing components (as they are commonly called) are written, manipulated and displayed completely in Java language. The following Swing Overview gives a few of the components from the javax.swing package. JLabel An area where uneditable text or icons can be displayed. JTextField An area in which the user inputs data from the keyboard. The area can also display information. JButton An area that triggers an event when clicked. JCheckBox A GUI component that is either selected or not selected. JComoboBox A drop-down list of items from which the user can make a selection by clicking an item in the list or by typing into the box. JList An area where a list of items is displayed from which the user can make a selection by clicking once on any element in the list. Double-clicking an element in the list generates an action event. Multiple elements can be selected. JPanel A container in which components can be placed. JColorChooser We can create our own color palette. Because javax.swing.JComponent class is the subclass of java.awt.Component class, we can use methods like setBackground(), setForeground() etc. to swing components like JButton and JTextField etc. 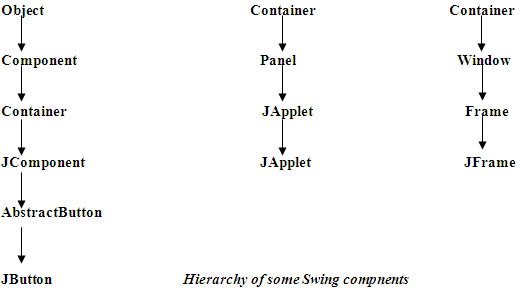 Swing components are typically named as JXxx. Class JComponent is the superclass to most Swing components. This class defines the set of methods that can be applied to any subclass of JComponent. A pluggable look and feel that can be used to customize the look and feel when the program executes on different platforms. Shortcut keys (called mnemonics) for direct access to GUI components through the keyboard. Common event handling capabilities for cases where several GUI components initiate the same actions in a program. Brief descriptions of a GUI component’s purpose (called tool tips) that are displayed when the mouse cursor is positioned over the component for a short time. Support for assistive(related) technologies such as Braille screen readers for blind people. Support for user interface localization — customizing the user interface for display in different languages and cultural conventions. For other features refer: Java JFC Swing Introduction. Similarly with, JApplet also, we need not import java.applet package because JApplet implicitly extends Applet class. As in the AWT, JFrame is the starting point for developing graphical applications. JFrame is one of the few Swing components that is built on an underlying "heavyweight" window. Components must be added to the content pane, not directly in the JFrame. Changing the properties like layout manager, background color, etc. should be applied to the content pane. Content pane can be accessed using getContentPane( ) method of JFrame. In which package and class the getContentPane() method is belonged? getCotentPane() is a method of javax.swing.JFrame with the following signature.